Those looking for a solitaire engagement ring with a more substantial, thicker band will find this setting to fit the bill. The 18k white gold band is beautiful and elegantly cradles your center diamond securely with a prong setting. Available only for round diamonds. Micropave details add unexpected sparkle to the prongs securing your center diamond, making this 14k white gold solitaire engagement ring even more beautiful. This ring can be set with a round, princess, Asscher, oval, cushion, or radiant cut diamond. Your 14k white gold band will be decorated with plenty of sparkle with this setting! We like the vintage look and plethora of diamonds on this beautiful ring with the paves and sidestones. 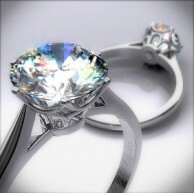 We love the surprise diamonds on this platinum solitaire engagement ring. The sides also taper in slightly at the top, near the center diamond and prongs. This ring also features Ritani's "X-O" design, where the prongs create an X and the band makes an O (we see the O more than the X, to be honest). Anyway, beautiful ring, and a great choice. You can set this one with any size or shape diamond. We love this setting because it's elegant, but not too complicated. This pave diamond engagement ring has extra sparkling diamonds that you won't find on a simple solitaire setting, but it's not overstated or exaggerated.